Windows operating system is still Microsoft's bread and butter, meaning any new launch is always accompanied by industry hoop-la. After multiple delays, Windows 10 is set to arrive on 29 July for PC and tablets, and Microsoft has kicked off a fan-oriented campaign called ‘Upgrade Your World’ to celebrate. Microsoft has released multiple build versions of the OS for testing in the run-up to the launch, notching up five million testers to date. To say thank you, the 'Upgrade Your World' campaign will focus on Microsoft’s "biggest fans", with events in 13 cities including London, Madrid, New York, Delhi and Tokyo. Microsoft will put on experiential demos, hands-on opportunities, entertainment and give fans the chance to meet its Windows team. The company will also put some marketing muscle into persuading people to upgrade from older versions of Windows. This remains a key challenge for Microsoft, with the majority of the world’s PCs still running on Windows 7, which Microsoft stopped supporting at the beginning of this year. The company has worked with retailers including Currys/PC World, Staples and Best Buy and Wal-Mart in the US to create "experience stations" where customers can try out Windows 10 or upgrade. 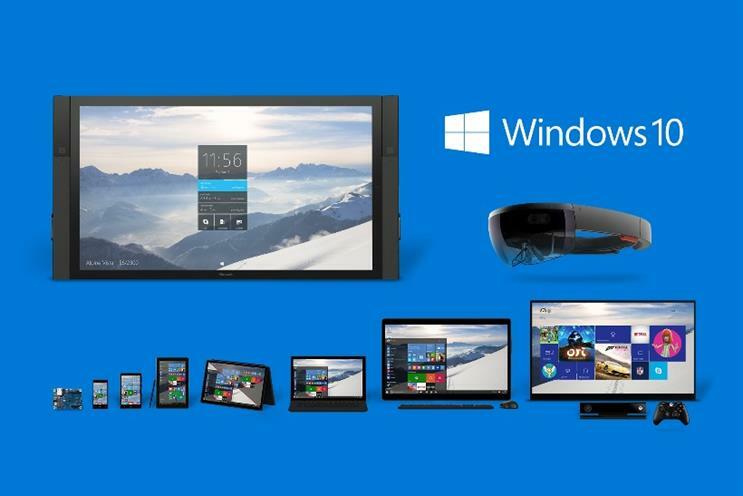 Microsoft has also floated at a new global ad campaign beginning 20 July for Windows 10, covering TV and digital. The ads will centre on Windows 10 features such as new browser Microsoft Edge and facial recognition service Windows Hello. The wider Upgrade Your World campaign will also see Microsoft stump up $10m towards a number of global and local non-profits. Windows 10 is regarded as Microsoft’s most important operating system release yet, since it’s the first version of Windows that will span phones, PCs and tablets. The new release is also weighted by the baggage of Microsoft’s previous operating system, Windows 8 (inexplicably, the company decided to skip Windows 9 altogether). Windows 8 marked a radical change in direction, ditching the traditional Start menu for a panel of touchscreen apps. It also introduced certain apps that launched full screen by default, making multitasking difficult. These and a number of other features attracted strong criticism, with Microsoft relenting for Windows 10 and reinstating the Start menu, and creating resizable apps.